You’ve seen those pictures of men or women who are about to be executed by hanging, right? 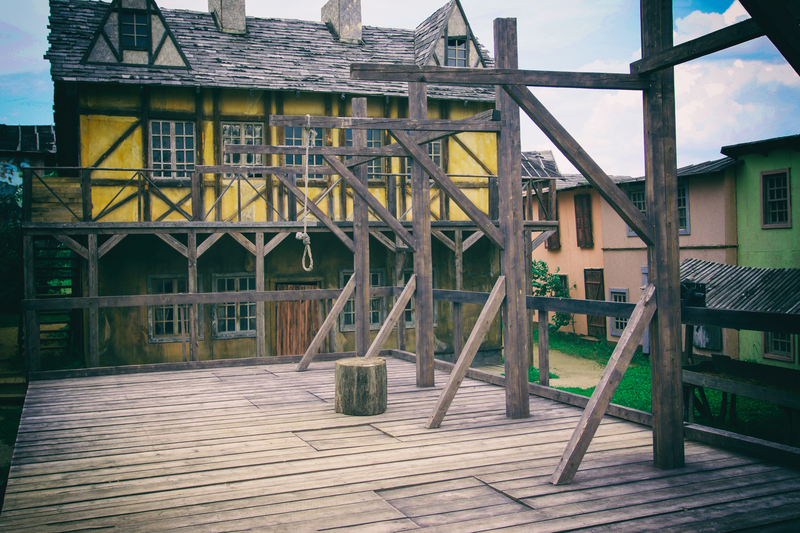 The gallows, designed to take their life, consists of a wooden structure that has a thick rope suspended from it. That rope is meant to be looped around the individual’s neck. The unfortunate individual then is forced to stand on a trap door that will drop from beneath the feet. When that person drops down, his entire body weight is suspended by the rope around his neck, causing his neck to either snap or totally impede his ability to breathe. That person dies by asphyxiation. If he is saved and his heart is right with God, through the acceptance of Jesus Christ as his Lord and Savior, he will immediately go to Heaven. If the opposite is the case, however, and he is not saved and his heart is not right with God, he or she will immediately arrive in Hell. You would think that no one who knows the outcome of falling into Hell, and who is in his right mind, would intentionally and willingly step upon that trap door, attach the rope around his own neck and pull the lever that will drop the door from beneath his feet, thereby sending himself or herself to a burning Hell. Yet, spiritually, that is happening every day. The people who I am addressing this warning to are those who have been saved, sanctified and filled with the Holy Ghost, and then, for whatever reason, choose to reject the peace, sanctity and safety of a life in Christ and turn from the Lord back into a world of sin. No one is forcing them to do it, they are doing it to themselves. The Bible says they are drawn away by their own lusts and enticed. They know of God’s goodness and His love for them. They realize that Jesus sacrificed his very own life for them, yet they walk away. Why would an individual do such a thing? The Bible tells us that no man can pluck us out of the hand of the Lord. Yet, it does not say that we cannot leave Him or remove ourselves from the Lord’s hands. John 10: 28 says And I give unto them eternal life; and they shall never perish, neither shall any man pluck them out of my hand. I have bad news for those who think that just because they have lived for the Lord for a length of time that their past history will get them into heaven. All of the living holy that you lived, your witnessing, sacrifices and all of the good that you have done will be forgotten if you die in unrighteousness. Don’t die like Millie Sue died. When Millie Sue’s Pastor/husband of 40 years passed away she saw her opportunity to go to ‘Vegas and have a fling, then go back to her home and church and resume living for the Lord. She had been saved as a young child, never drank alcohol, or smoked a cigarette. She was saved but could not get the idea of a “Fling” in ‘Vegas out of her mind. She helped many people to be saved and lived the Christian life. But there was that nagging desire to go to ‘Vegas. So, she went to ‘Vegas and had a rip-roaring time of gambling, drinking, spending the weekend with a young gigolo and “got it out of her system”. After all of those years as a Pastor’s wife and living the life of a Christian, she felt that she deserved one “Fling”. “Surely God will allow me this one Fling. He knows how I have lived for Him all of these years”, she told herself. On that Sunday evening she boarded the plane for her hometown. “No one will ever know”, she thought because what happens in ‘Vegas stays in ‘Vegas.” She forgot that we serve a God who never sleeps or slumbers. She also forgot to repent. She thought she would do it later. Unfortunately for her, she fell asleep on the plane and she only woke up as the plane crashed. Millie Sue didn’t even have a chance to think about Jesus, much less to repent. When she opened her eyes they opened in a burning Hell. No one led her to her gallows. She went on her own. Ezek. 18:24 says But when the righteous turneth away from his righteousness, and committeth iniquity, and doeth according to all the abominations that the wicked man doeth, shall he live? All his righteousness that he hath done shall not be mentioned: in his trespass that he hath trespassed, and in his sin that he hath sinned, in them shall he die. Let me reiterate this fact. When an individual who was once saved turns his or her back on God and willfully goes into sin, he is akin to one who climbs the steps of the gallows, affixes the rope around his own neck and intentionally pulls the lever that drops the trap door, plunging himself into that awful place called Hell. Please, I beg of you, step away from the trap door and take your hand off that lever. Repent and turn back to God. Beautifully written! God bless you. Thank You Jesus For This. Such An Uplifter To Keep Fighting And Pressing On.